“Dhabbas” are little eateries situated in highways in India and Pakistan. They are known for their typical cuisine which is highly spicy and rich in flavour. Today many restaurants have dhabba style dishes in their menus which are inspired from these small roadside eateries. I myself have been to one such dhabba on the road from bombay (now mumbai) to pune. It was quite an experience and the food? Ooh…it was absolutely delicious. Each dhabba ofcoruse boasts of its own secret recipes. This recipe of mine has been taken off the internet and then improvised by me. I have noticed that many of you want oil free recipes so i made this recipe without a drop of oil. I actually did not expect it to taste the way it did and i am very pleased with the way it turned out. For this i ground a blend of spices which i shall call Nitus Magical Spice Blend… this can be made in a large quantity and bottled.- I used my amazing bullet to make this. 1. Clean the chicken and put it into a thick good casserole and add 1/2 cup of water, salt and the ground paste,bay leaves and curry leaves. 2. Boil it till the water evaorates and the chicken is half cooked. In Spain we have tender chickens, if the chicken in your country takes longer to cook please add some more water. I just needed half a cup. 4. Once you see the chicken is done (you will know it you try to cut a small piece and its white from inside) add all the spices and cook till you see the chicken will start to stick to the pan. Do not panic! 6. Cook now for a few minutes till you see the sauce thickening and you can see a few drops of oil. This is the natural fat from the chicken. Check a piece, if it breaks off easily from the bone its ready!! If not add some more water and cook till done. 7. Add the lemon juice and coriander leaves . Check the seasoning and correct. 8. Serve hot with either boiled basmati rice, naans or rotis. The amount of sauce(gravy) you want can be adjusted by adding water accordingly. 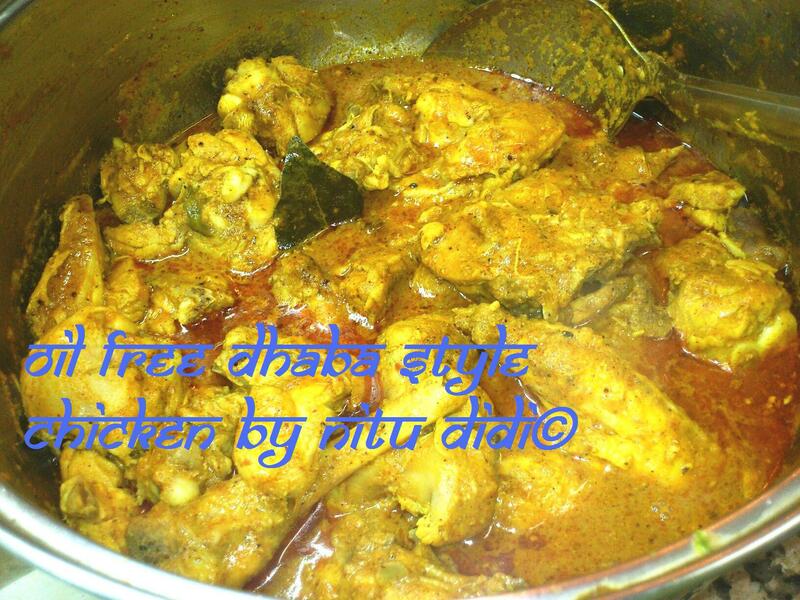 This entry was posted in Chicken, Gluten Free, Healthy Options, Ideas for meals, Indian Restaurant Dishes, Low Cost, Magic Bullet, Nitu´s Spicy Delights, NO OIL RECIPES, Quick Recipes, Spices, Step by Step and tagged chicken, dhabba, healthy, low calorie, nitus magical spice blend, no oil, oil free, spices, spicy. Bookmark the permalink. Parece complicado, pero leyendolo bien no es así. The picture shows aoil floating on the top. Where did it come from? Yes, Even I tried the recipe and the chicken does leave some oil in the gravy. My suggestion here would be to boil chicken outside first, remove stock and then use the half boiled chicken to make this dish. I guess this will leave us with less or no oil left by the bird in the dish. Worth a try for health conscious people. Overall Fantastic recipe. I loved it. Thanks.. I shall be making this dish. Sounds good “Oil Free”. Thanks iTunes.